Pace Bend 2/21 Who's In? Joe's Pro Bikes, Cat 4. Hey we finally get to race together....look forward to seeing you! I'm racing Walburg, does that count? Considering how aweful the weather usually is for Wahlburg it counts double. Maybe, maybe not. We'll see. I'm planning to. Cat 3 JPB. incognito in my new team kit. No. It would be 3 weekends and 26 hours on the road for the month. I'll be there in spirit though, Walburg was my first TX podium, and I've no doubt the team will do well. Yeah, we have solid shots at the podium in 4s, 3s, and M40+. I'm in. Walburg 5A and Pace Bend 4/5. Just signed up for Walburg....So, who ya tipping for the 4's? Anyone else on here doing Cat 3? Unattached 4. Skipping Walberg, though. Not many of us unattached guys these days. I've got a team I'm fixing to join, but I don't have kit yet. Said they were ordering it, and it should be in 10 weeks from now. Welcome back! Is this the first race since the crash? Looks like NRC/FactoryGoodness and AT&T are fielding some big teams in the 4's. That's a fun circuit. Definitely a nice change of pace from Walburg. My legs were still pretty sore from Saturday, and i almost didn't go. But once the race started, i felt ok and the surges and power hills seemed manageable. Until the second time up the climb on the back of the course, when just as i sat and got ready to chase the leaders surging over the top, the guy in front of met let off the gas and i wasn't able to avoid his rear wheel. 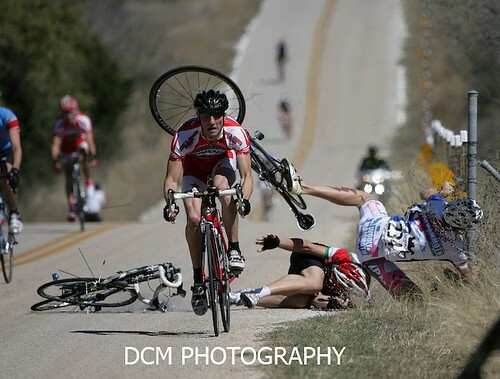 Fortunatly, only one other rider went down, and at pretty low speed. We were both able to continue. Anyway, i finished the race, got a little practice applying Tagaderm, and will have a bit of wheel truing to do. Even with the mishap, i had fun racing and am glad i didn't wuss out.